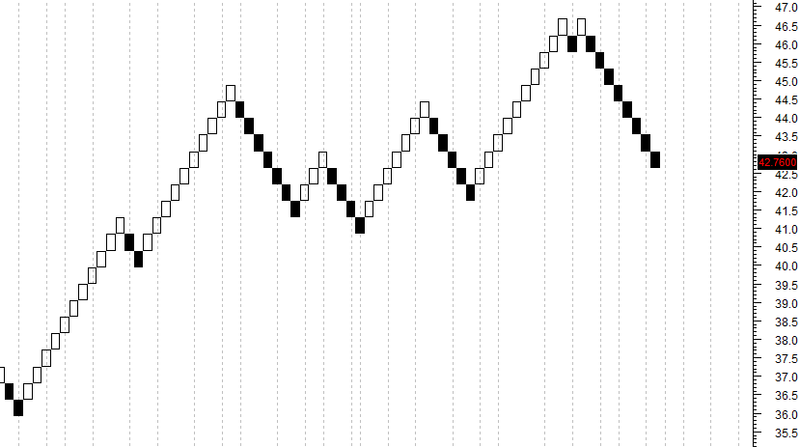 How Renko chart is built? Problem is that not every trading software has it build in. If you are using Metastock, you have it build in. If you trade Forex and you are using MetaTrader4, that is another story. I tried some Renko plugins for MT4 and did not found any good one. Thankfully, there is a solution for Forex traders. 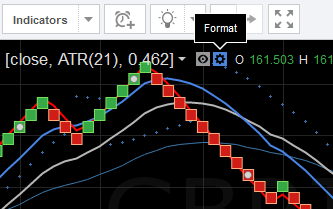 Its online charting software http://www.tradingview.com. It is not free. 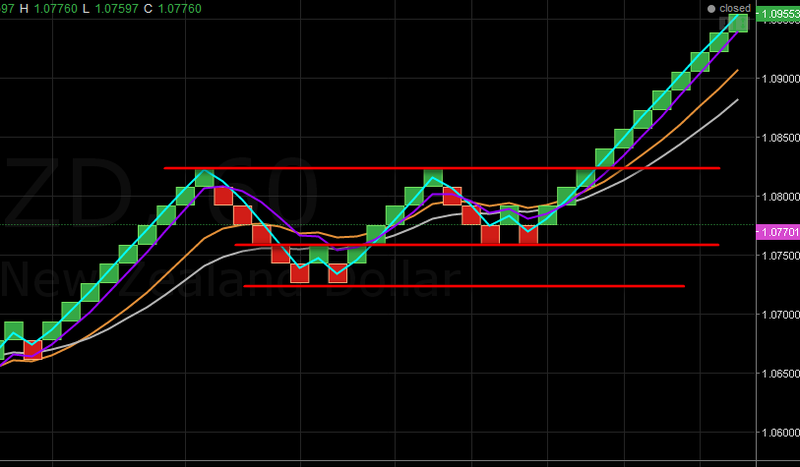 If you want to use intraday Renko, there is a monthly subscription of 15$. 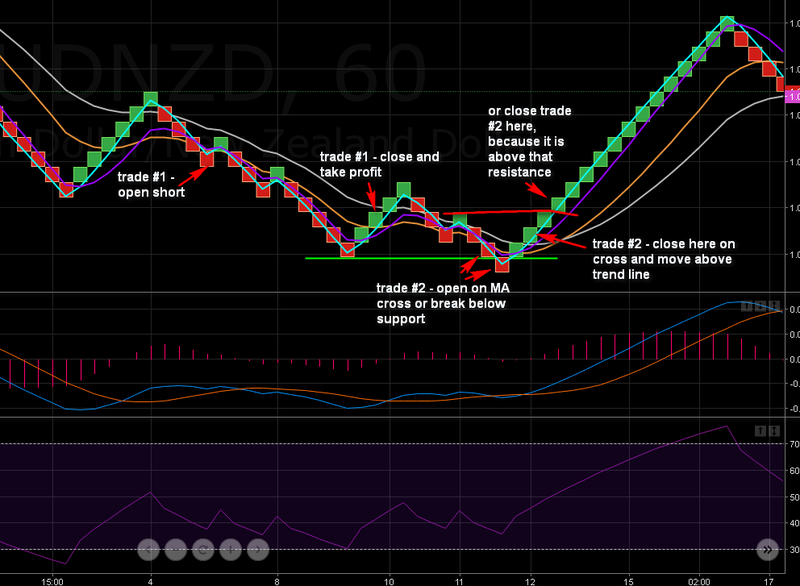 I think it is a good price, because you get a whole charting software with Renko included. The main problem with Renko is that you have to set box size. You can do that with ATR or set box size manually. ATR is ok on stock market, but on Forex pairs I prefer to set box size manually. Problem is, there is no golden rule to set correct box size. With very small box size you will see several boxes appear at once. This makes trading very hard and you can easily get confused. For example, you set box size to 3 pips. The trend is down, you see leg of red boxes. 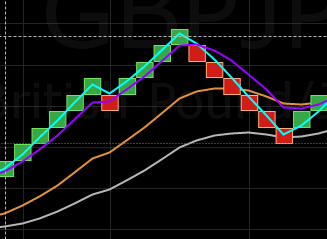 Suddenly price hit reversal and moves 30 pips up and you get 10 green boxes at once. For most traders, this settings are too sensitive. With bigger box size, let’s say 15 pips, you will see only two boxes and you can see better market picture. It is hard to show you on screens, but you will know that when you see it on live chart. 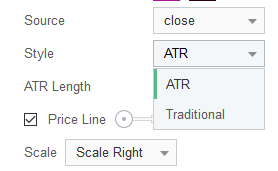 The safer way for new traders is to use larger box size or boxsize based on ATR. Thanks to that you will not overtrade and you will catch bigger trends. So how to set proper box size? Decide if you are trading short term or long term (1 day or longer). It is up to you. I prefer bigger box sizes because with them I can catch bigger moves. 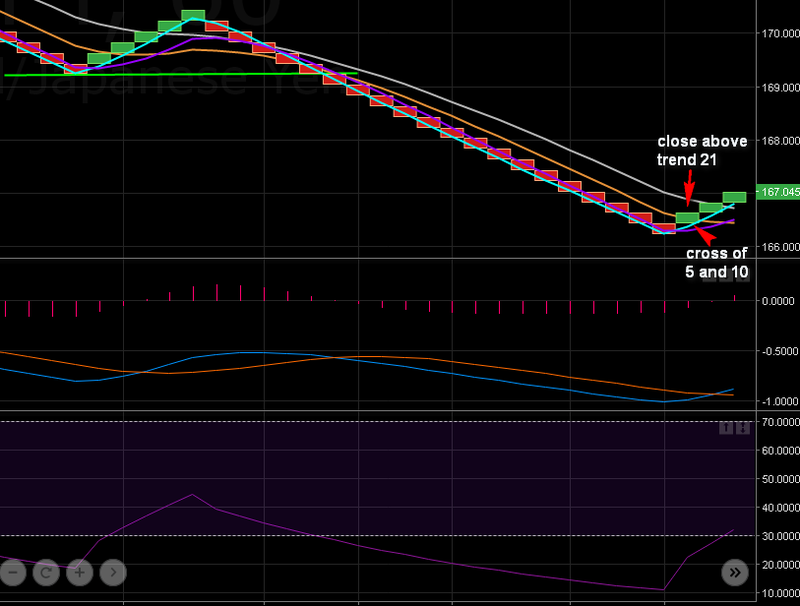 I knwo that there is a group of traders, who use Renko even for scalping. You have to decide what is best for you. I will show you some example sizes which I use in TradingView. Remember, it is not like there is only one correct box size. You may use different size. Below are box sizes I use on popular FX pairs. Sometimes I change it, it is not written in the stone. If I see that market is moving slower than usual than I will lower box size. It comes with the practice. First I open normal candlestick chart and observe price action in a history. 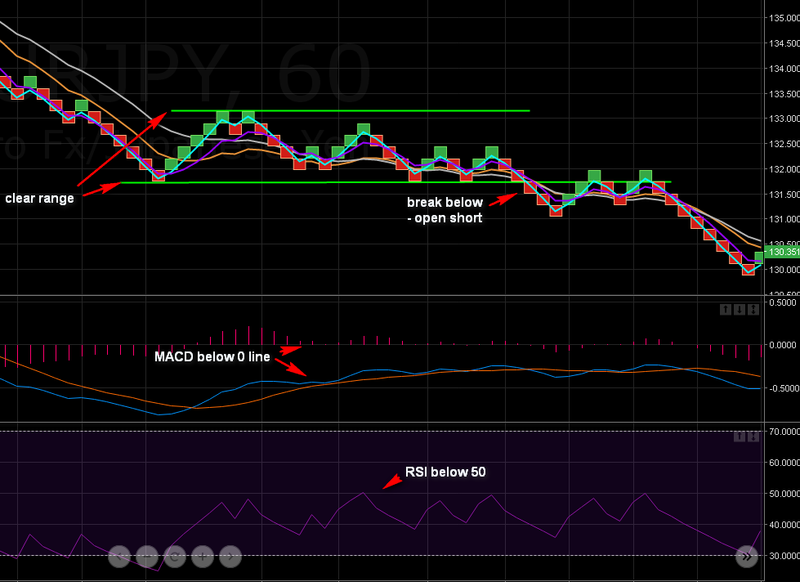 You can easily see that GBPJPY is strong trending. It is not unusual for that pair to move more than 500 pips in few days. Later, if you decide that you want bigger or smaller box, you can switch to manual. 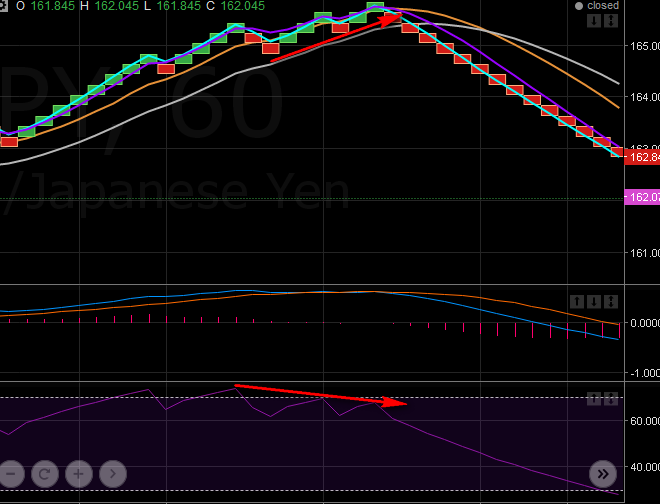 I like Renko, because it filters the noise from the price. Reality is that every year we see more and more robots trading markets. Forex is great for them because it is 24 hour market with good liquidity. For us it is bad because it creates so much mess. That is the main reason why I do not trade 1m or 5m and switched to higher time frames. There are many ways you can use it in your trading system. 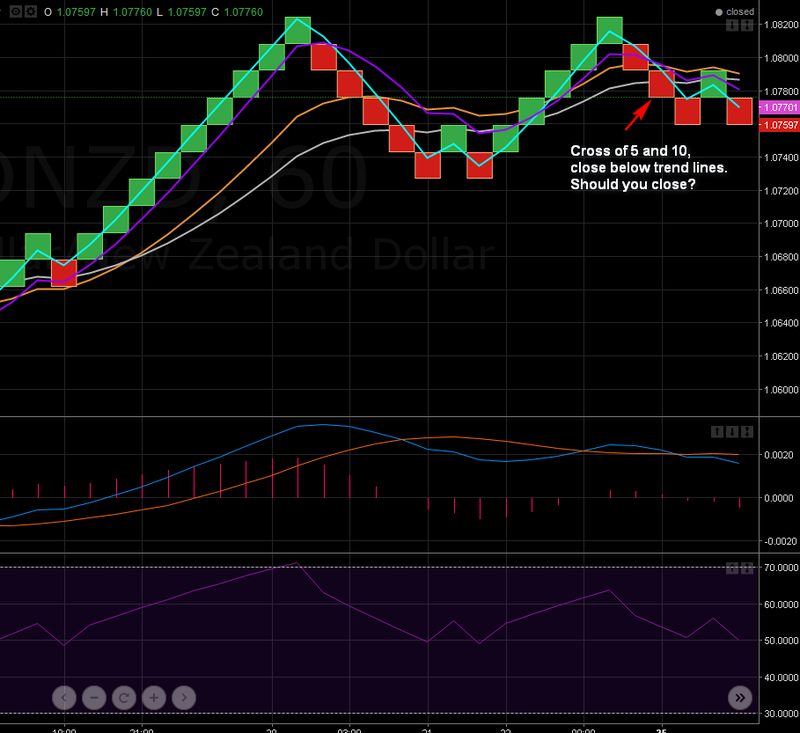 Same way you use normal candlesticks and put indicator on it, you can trade same way with renko. As name states, you hunt for breakouts. Just like in normal trading with bars or candlesticks. 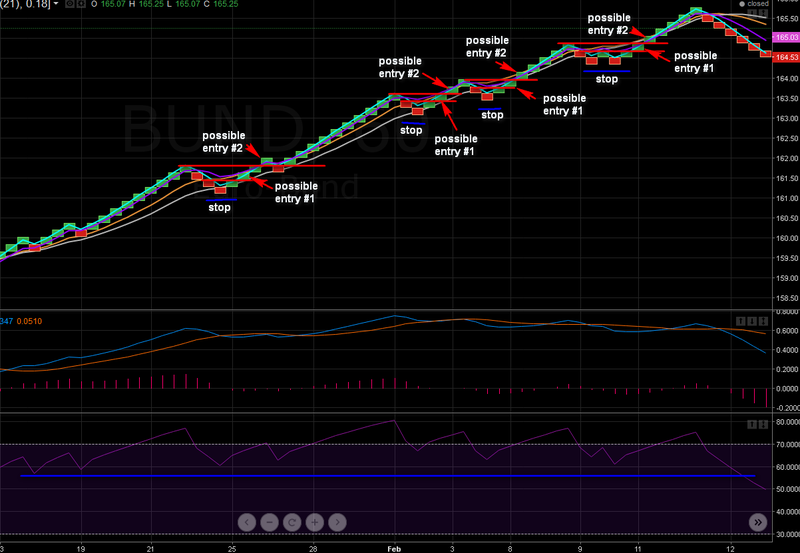 The difference is that with Renko it is easier to spot breakouts. Of course, you may see false breakouts. It is good to use that approach with other tools, to be sure that you are trading in the same direction as the main trend. You will see more of that in practice in examples. Again, normal hunting for patterns as you would hunt on candlestick or bar chart. So you look for double top, double bottom, head and shoulders etc. 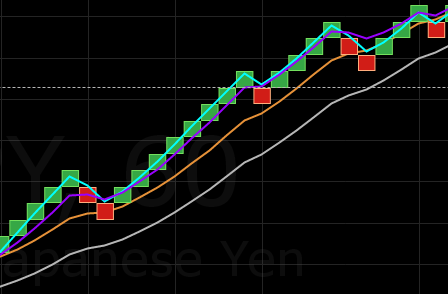 My favorite way of trading with Renko is to combine it with indicators. If you already have a working system or set of good indicators, test them with Renko. Thanks to noise reduction you should get better signals. 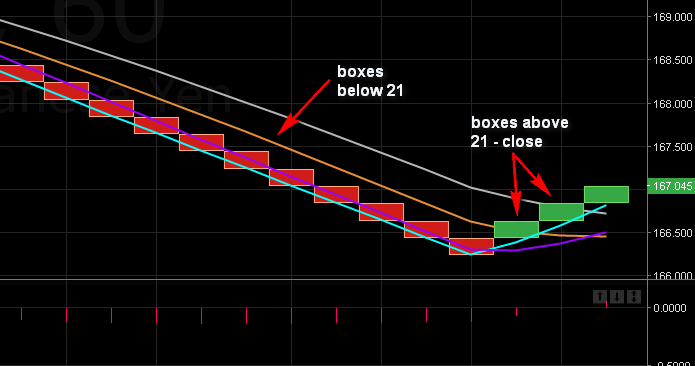 Even with the best box size you can see that market will move sideways. Flat markets are hard to trade because there is no clear trend and you can easily overtrade and take many losses. Thankfully, with Renko you can easily mark top and bottoms. If you see a correction, it is a good practice to mark top and bottom with support and resistance line. That way you will remember that there is a risk of range move unless price break up or below. More of that in examples. I based my strategy on DEMA averages. You can experiment with another kind of averages, but I like Dema most. So, nothing fancy here. We have two groups. First I check if 21 is above 33 – then it is an uptrend. Otherwise, trend is down. Signal lines are on the chart to give me an idea where current move is going. Sometimes I take cross, but not always. On many times, I close position based on RSI and open based on breakout. That is because averages are lagging. I mean, they are updated when new box is closed. Still, it is a good indicator of what is going on and I hope you will understand more when you see examples. Let’s start with an easy one. We have here a correction in a clear downtrend and we are looking to enter a short position. 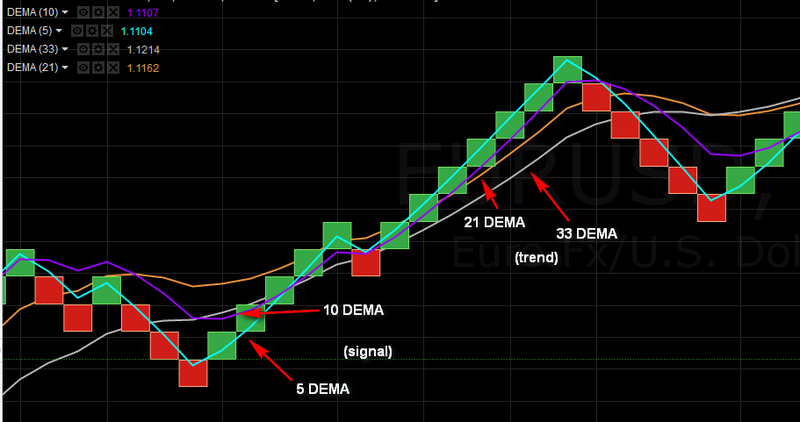 We do not look for a long position because 21 DEMA (orange) is below 33 DEMA (white). 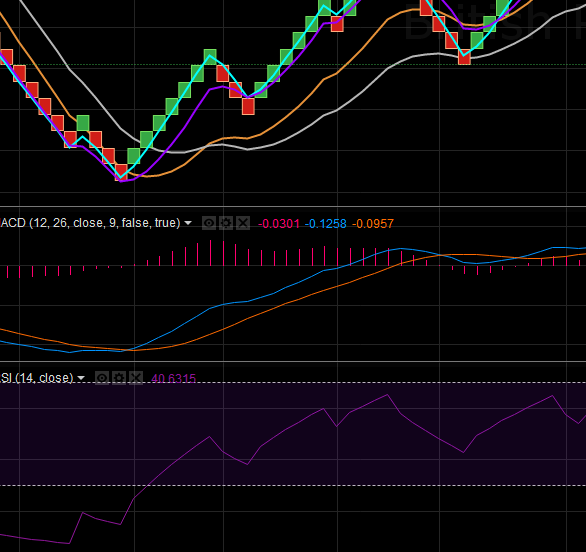 Also, MACD is below 0 line. There are few signals which we can take to enter short. First we saw a cross of 5 and 10 DEMA. A good place to take short. If we wanted better signal, then we have to wait to break below recent low (green support line). 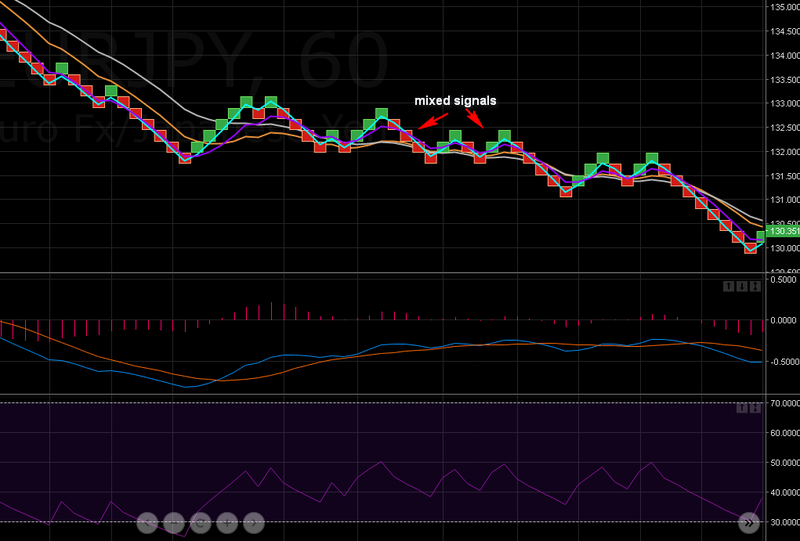 In the same time there was a signal from RSI. Same trade, the trend is strong. Eventually, there is a green box and the best exit position, in this case, is after the first box. We have two signals to do so. We could also wait, but later there was another signal to close, when thord green box closed above 33 DEMA. On many times, I do not wait for a cross of 5 and 10 but I watch the position of box against trend lines. You have to observe situation to decide which one will be more important. Clearly 33 DEMA is a resistance here, 21 is not respected. That’s why we see green box above 33 DEMA, it is time to close short. If my play on trade is to hold as long as possible then I will keep trade open. It is up to you. If you want to play safe, then you can always exit on cross/other signal and reenter trade. 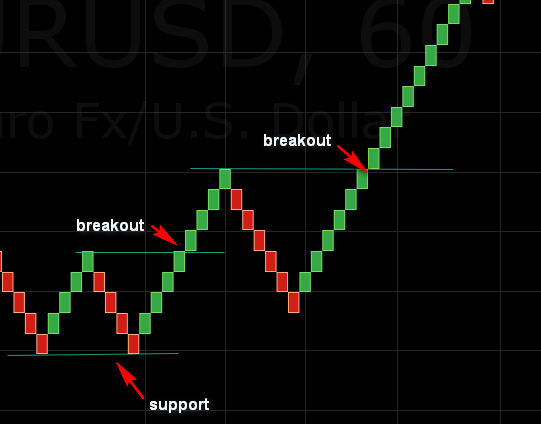 Divergence – when price makes new high but indicator does not confirm that, work pretty nice with Renko. Thanks to the filtered price action, you can see clearly where divergence takes place. It is very powerfull signal and it is much easier to spot than on normal candlestick chart. 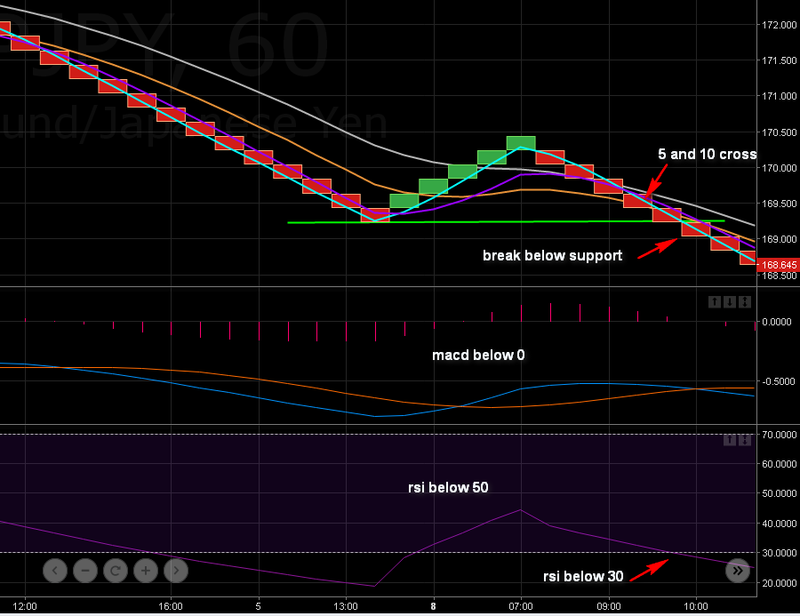 Finally, there was a break below lower support and a good entry point for short position. It is important, not only with Renko but overall, to be disciplined about money and position management. You will not catch a strong 200 pips move with every signal. It is normal in trading that sometimes signal will be false and market will move against you. It is important to close position when market is going against you. 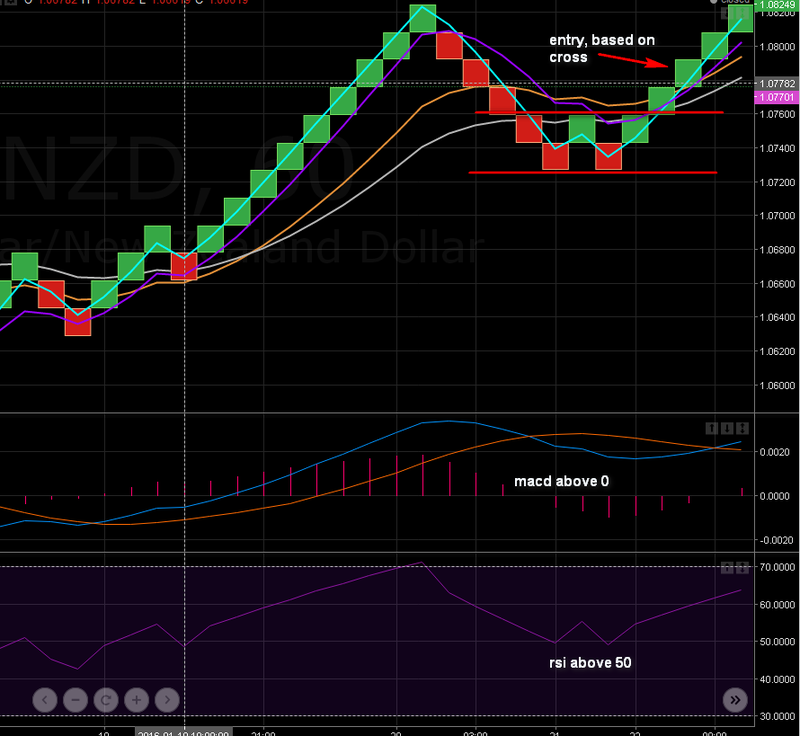 This AUDNZD chart is a good example. Trend is down. Trade #1 was nice and easy. First we saw a cross of 5 and 10 and it was a good place to go short. Later, there was another cross with 5 above 10. Time to close and take profit. You can see that later there was a strong move up. It was a good idea to close this position quick, with a small loss. I closed position here above that red line. I simply thought that there will be some return for a moment and continuation down. It is a hard part – to decide when to close trade when something goes wrong. You may and you will see many similar situations when everything is going well and suddenly price turns around. There is no 100% sure trading system. Money management is more than 50% of success. Price did not manage to break above recent high and 5 closed below 10. It does not look good. Question is, should you close long position or wait? Take a look again. Remember the range (red lines) from first chart? If price has found support there, it is best to place stop loss below that range. In that case, you should wait it out, knowing that you have a stop loss in place. 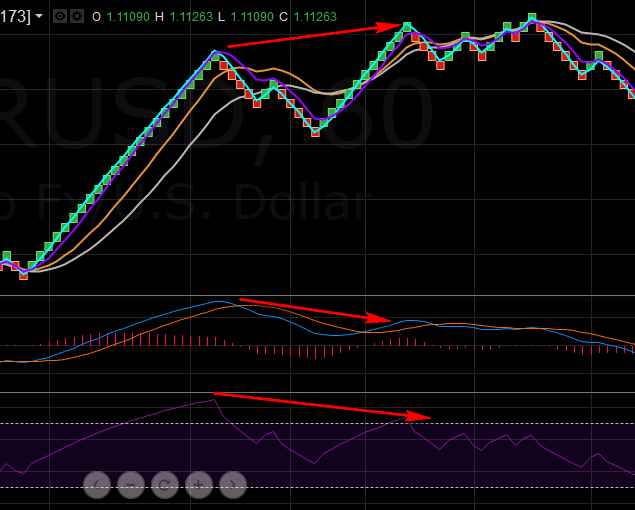 Also, MACD and RSI are still positive. I should add, that if not that range, I would close it at first place, after that 5 and 10 cross. This is a very good example because it shows you that if you see lows or ranges or other important support/resistance areas, you should use it. One thing about crosses. As I wrote before, I do not always use them as the main signal to enter a trade. There are cases when trend will be so strong and correction so shallow that cross of 5 and 10 will lag. Like in this example. What to do with that? Use different set of averages or trade simply based on breakouts. Where did possible entry #1 come from? Take a closer look. It is a second green box. Possible entry #2 was more sure signal to enter. And when to exit? 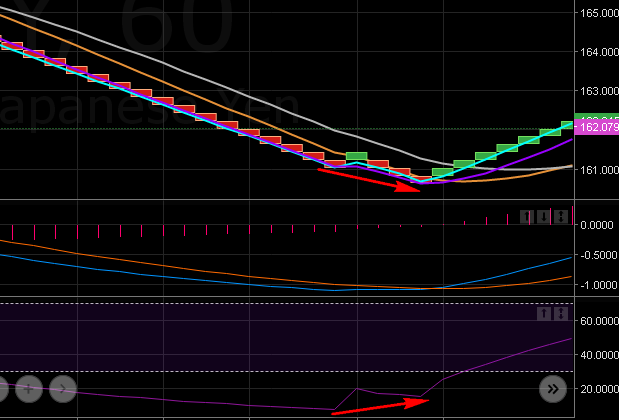 Take a look at RSI. For all the time of move up, it was holding above that blue support line. When it broke below it, it was clear that trend is not that strong anymore. Hi Simon, this is a good read. I have started using Renko and I find it a lot easier to use purely as it removes the noise. There's a beauty in its simplicity! My question to you is, how do you easily screen for when to make trades or when to exit? I have been doing it manually and you can sometimes miss a trade or, potentially worse, miss an exit (I've started using trailing SL to combat this). Also, what time frame are you using for your Forex pairs? About screening. First of all, I have seperate monitor so this makes life a little bit easier when it comes to screening. I also use pending orders which can be a great help. Learn more about it here: http://www.learntotradethemarket.com/forex-university/how-to-set-up-trade-entry-metatrader-platform. For exit I use take profit target (based on Fibonacci / Pivot lines) so I don't have a problem here. Hello Simon i need the download link for the file.